The demand of Madhesi Morcha is simple: implement the 22 point and 8 point agreements. The fact is that the 22 point agreement was signed on August 30, 2007 by two people – Upendra Yadav and Sitaula. Hence, Sitaula knows the demands of Madhesi Morcha very well but has exposed his amnesia by feigning ignorance. This article will aim to provide an answer to such questions. In his first address to the nation, Nepal’s PM KP Oli said the constitution has guaranteed equal rights to everyone and requested Madhesi Morcha to end their protests and enter negotiations. The demands of Madhesi Morcha is simple: implement the 22 point and 8 point agreements signed in the past between the United Democratic Madhesi Front (UDMF) and the Nepal government. No further negotiations are necessary. The 22 point agreement was signed on August 30, 2007 and six months later yet another 8 point agreement was signed. Coincidentally, these agreements include several clauses that overlap with the major demands of Madhesis Morcha during the current unrest – Madhes Andolan III. Madhesi Morcha is not proposing any new demands but is protesting for the implementation of past agreements. This article will focus on relevant clauses in 22 point agreement and a follow-up article will focus on 8 point agreement. Federal Demarcation to create two states in Tarai-Madhes: one from Jhapa to Chitwan called Madhes and another from Chitwan to Kanchanpur called Tharuhat. Electoral constituencies should be based on population in Tarai-Madhes instead of geography. Ensure proportional representation of all ethnic groups in all state organs. Ensure gender equality via fair citizenship provisions for children born to Nepali mothers. The protests began after the four major ruling parties divided Nepal into six federal provinces. This division did not create federal provinces in Tarai-Madhes as desired by Madhesis and Tharus. Arrangements will be made for a federal state with regional autonomy while the sovereignty, national unity and integrity of Nepal will be kept intact during the restructuring of the state. The rights, nature and limits of regional autonomy will be as decided by the constituent assembly. How will these federal states be demarcated? To immediately establish a commission for state restructuring and ensure that it comprises of experts in an inclusive manner. On Jan 20, 2010, State Reconstruction Committee of Constituent Assembly passed a federal structure of 14 states supported by all major parties including UCPNM and UML. 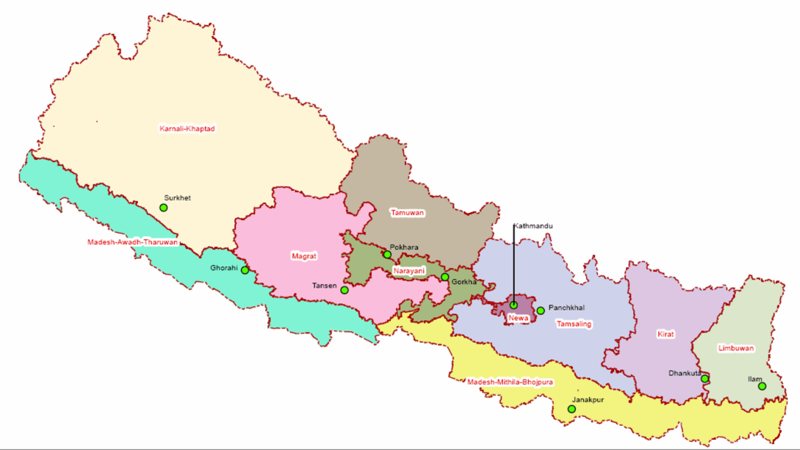 Note that Jhapa, Sunsari, and Morang were included in Madhesh (State 2 as in 2015 map). Similarly, Kailali and Kanchanpur were included in Tharuwan (State 5 as in 20115 map). Similarly, on Jan 19, 2012, State Reconstruction Commission proposed two separate federal structures, one with 11 states (including one non territorial state) and another with 6 states. The 11 federal states structure has been lauded by a consensus of several groups, civil societies, and scholars for its foresight, inclusiveness and attempt to bolster marginalized groups. The map below in Figure 1 shows the 11 federal states that were proposed. If these federalism model were agreed and passed in 2010 and 2012 by Constituent Assembly, then why was the map changed in 2015 by a handful of ‘expert’ leaders from ruling parties that has stirred Madhesis and Tharus? If the recommendations of state restructuring commission is followed, the first demand will be easily met. The second demand is that the number of electoral constituencies for first-past-the-post system should be based on voting population instead of population and geography. Special provisions could be made for remote hilly districts however. It should be made clear that after several agreements and disagreements, the Interim Constitution was drafted which institutionalized these agreements and served as a blueprint for the constitution. However, several clauses of the Interim Constitution was deliberately violated by the ruling parties while drafting the new constitution. The discrepancy between the Interim constitution and 2015 Constitution is clear on the issue of how constituencies are determined. The members elected on the basis of first-past-the-post electoral system consisting of one member from each of the two hundred and forty election constituencies delimited by the Election Constituency Delimitation Commission constituted pursuant to Article 154A, based on the population fixed by the national census preceding the election of the Constituent Assembly, while treating an administrative district as an election district, and, as far as possible, maintaining the same proportionality between such districts and the number of members; (a) One hundred and sixty five members elected from first-past-the-post electoral system consisting of one member from each of the one hundred and sixty five electoral constituencies, formed by diving Nepal into 165 constituencies based on geography, population and provincial balance. The clause to determine the number of constituencies based on geography, population, and provincial balance was not agreed upon and it puts Nepalis in densely populated southern plains at a disadvantage. If the provisions agreed in the Interim constitution can be restored, demand 2 will be met. The third demand is to ensure proportional representation of all ethnic groups, not just Madhesis, in all state organs. To ensure balanced proportional representation and partnership of Madhesis, indigenous peoples/janajatis, dalits, women, backward classes, disabled people, minority communities and Muslims who have been excluded for generations, in all organs and levels of government and in power structures, mechanisms and resources. To have suitable proportional representation in all political appointments by the government, in Foreign Service and services including the education sector, as well as in commissions. To immediately establish a High Level Task force for Inclusion to determine the rules and draft laws necessary for the inclusion of Madhesis, indigenous peoples/janajatis, dalits, women, etc. in all organs and levels of the state. The High Level Task force incorporated these agreements into the Interim Constitution but the word ‘proportional’ was deliberately removed from the new constitution by the ruling parties. This omission is not an inadvertent error, but a conspiracy. in the structures of the State on the basis of the principle of ‘proportional inclusion. 47. Right to social justice: (1) Socially backward women, Dalits, Adibasi, Janjati, Khas Arya, Madhesi, Tharu, minority groups, marginalized groups, Muslim, backward classes, gender and sexually minority groups, youths, peasants, labourers, the oppressed and the citizens of backward regions, shall have the right to employment in state structures and public service on the basis of the principle of inclusion. If the word ‘proportional’ can be put back in Article 47 in the constitution, as agreed previously and institutionalized in the Interim constitution, demand 3 will be met. The fourth demand is to guarantee gender equality by providing same citizenship benefits to women and men in Nepal. This is a no-brainer and a basic human right that every woman deserves but is denied in the new constitution. Nepal’s constitution provides naturalized citizenship to children of a Nepali mother and a foreign father. However, it provides citizenship by descent to children of a Nepali father, irrespective of the mother’s nationality. This seemingly innocuous difference is discriminatory. Naturalized citizenship has several curtailed privileges than citizenship by descent so, a child born to a Nepali mother has much less privileges than a child born to a Nepali father, irrespective of their spouse’s’ nationality. Much has been written and said about women being rendered as ‘second class’ citizens by the Nepal constitution. See article “Second-Class: The Nepal Embassy and Citizenship Inaccuracies” by Rob Penner and “Being a Woman in Misogynistic Nepal” by Khushbu Mishra. (4) A person born to a Nepali citizen mother and who has domicile in Nepal but whose father is not known, shall be granted Nepali citizenship by descent. However, the citizenship of such a person shall be turned into naturalized citizenship as provided for by law if the father of the person is proved to be a foreign citizen. There is no alternative to providing equal rights to women in Nepal or anywhere else in the world. This demand has been misrepresented by nationalists and patriotic media to imply that Madhesi Morcha is seeking greater privileges for naturalized Nepali citizens. The demand is for ensuring gender equality, not more privileges for naturalized citizens. Such falsifications have led masses to confusion and the nation into a near crisis. The secret to solving the current crisis in Nepal is simple: implement the clauses in 22 point and 8 point agreements signed between the UDMF and Nepal government, along with preserving the articles in Interim Constitution. If the past agreements can not be enacted, the trust is broken. The loss of trust may create irreversible damage, as many have started entertaining the idea of secession in the worst case. Besides, what is the purpose of having another agreement and how can it be assured that it will be followed if the already existing past agreements cannot be implemented?